I’ve been wondering about this question for a while but with a little free time I finally got around to having a decent crack at working it out with some GIS and statistics.The short answer: by my estimation about 120,000. Read on for the longer answer. Where are people Lindy Hopping? This is actually a somewhat difficult question. Scenes are constantly starting and folding – such as scenes in college towns in the US and those where expats are the primary drivers and consumers. * Plus the advent of the travelling lindy hopper has led to many camps being held in places that don’t have a regular scene. For this purpose a “scene” is a location that actually has some form of regular Lindy hop be that classes, social dancing or some other organising activity. My starting point was the World Lindy Hop Map which I supplemented with maps for countries and smaller scenes including the LA Lindy Hop Map, The Lindy Hop Map Australia, Lindy Hop and Swing Dance in Italy, and the UK Lindy Map. I ended up removing a whole bunch of points. There were plenty with incorrect geocoding (e.g. suburbs of cities that were coded to small towns, country entries sitting in the middle of nowhere etc. ), I also did a fair bit of checking to ensure currency of schools, events, etc. ** Finally I did a bunch of research to add new venues, website links and cover as broad a geography as possible. The final result was 827 organisations, dance schools or other evidence of regular lindy hop activity in a particular location. I’m sure I’ve missed plenty of organisations in local areas – but my mission was to see if a location had lindy hop, not how many dance schools/societies were there. Guess the map projection and you get a gold star. As I don’t plan on keeping this updated I’m not going to put it on google maps. However here is the data in kmz and shapefile format for those who wish to use the data in your own projects and maps. 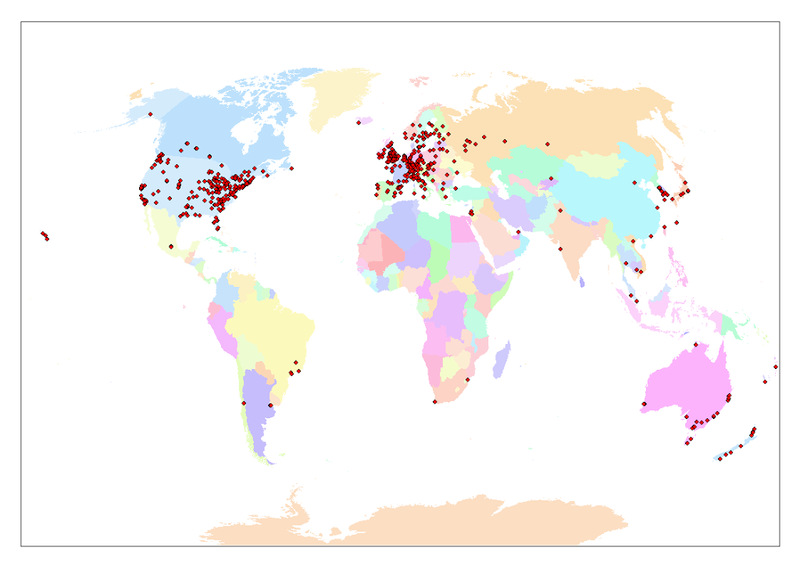 I’ve made my best effort with this data, but it’s necessarily incomplete and the locations are rather approximate – don’t use this for driving directions or holiday planning without further research! How many Lindy Hop scenes are there? Obviously, these locations aren’t all individual scenes. Recognising that some scenes are supported by 1 large organisation and others by many smaller ones I wanted to get at the number of geographically independent scenes. The answer – 463 scenes spread across 58 countries (or 59 depending on how you count Taiwan) and a range of self governing territories (e.g. New Caledonia, Hong Kong and the Åland Islands). How many lindy hoppers are there? 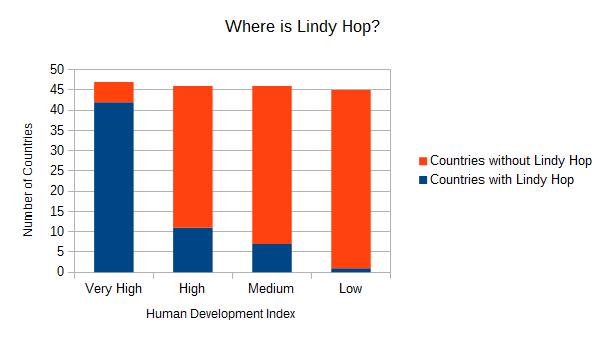 Given the data I’ve generated here’s a related question: How many people could lindy hop if they wanted to? To assess geographic access (leaving aside demographic and cultural factors that affect access) to the above listed venues I applied the World Population Layer to determine the number of people living within 15km of a lindy hop venue. The result: about 308 million people. Now onto the number of lindy hoppers. Rather than try and guess the average scene size (which can be tricky) I’ve applied some fancier statistics and a Monte Carlo simulation to get a bounded guess. There’s a more complete explanation and the code I used in a short R script I wrote here. The median scene size is somewhere between 50 and 150. The total number of scenes are 463. So now it’s over to you. Can anyone else come up with a better answer? * South Asia is a great example. I know of Lindy Hop being taught at one stage or another in Kathmandu, Mumbai, Dhaka, Chittagong, Bangalore, Dharamsala and Delhi at one time or another but combining short ex-pat contracts with a culture where partnered dancing is highly unusual it typically hasn’t stuck around. **It doesn’t help that there are literally hundreds of dance schools and other organisations out there whose websites seem to have been created back when geocities was popular and left unchanged (except for content updates). Seriously people, if wordpress is too hard for you spend the money on a web designer. *** And in those countries with Medium Human Development the lindy hop tends to be located in wealthier cities. This is probably also the case with lindy hop in countries with High and Very High Human Development. **** The average and the mode were also about 118,000. I’m not sure I completely understand the adding up process, but I wonder if using reddit is a problem? 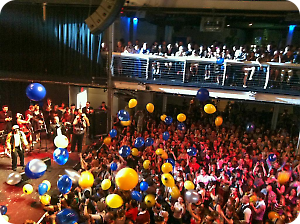 Its users aren’t necessarily representative of the broader lindy hop community…. fb would be a better tool (but of course is harder to use for this). 3200 followers and no leads? On the other hand I think men are rather overrepresented on the swingdancing subreddit (as on reddit more broadly), especially men who only like to lead, only think men should lead and don’t want to see men doing anything other than leading…. I’ve been working with Brittany Radke to rebirth the swingMap, which was popular in the 2000’s. If you looked at the, F100, and F95 data you’d get a better initial starting slate with 526 reference points. You’d still have to reduce them with geoNames as you did. Alternatively, Shesha Marvin collected over 5000 data points with his effort a few years ago. I did use some of the data from the World Lindy Hop Map with the Frankie 99/100 data – much of which turned out to be redundant, or be in locations where I could not find independent verification of something going on there. Is there a reference for Shesha’s effort? I can never remember the url, but I have his email! I’ll come back when I have it. This is fascinating, I think Juan Villafane was trying to estimate the world lindy population, and that’s really tricky because there are new dancers being born everyday and old dancers retiring, and some coming back out of the woodwork. Defining a “regular” dancer is a hard thing to do. There are people who Lindy Hop regularly once-a-month, and some more than twice a week…some say they know Lindy Hop, but others would disagree…then there’s people who only know 6-count swing and the super casual who have learned to swing out, but will never return to a social dance. And there are tons of people who used to dance before they had kids, or got busy with work or school…do we count them, even though they only show up once every two years. Some have danced for 5 to 10 years, they just don’t anymore? So who do we count as a lindy hopper in our census? Most statisticians who look at similar problems use a sort of recency of participation concept – for example how many people have been to a lindy hop event in the past two months (which is sort of the number I’m trying to get at). With this methodology however, you pick your median scene size (which you could make as expansive or as restrictive as you like) and largest scene size, make a few other assumptions about the distribution of scene sizes and get your answer. A census would never be possible – you run up against the problem of who do you include and how you would reach them. A more robust method than the one I presented would be to survey lots of dancers and get them to estimate the size of their own scene. This sort of wisdom of crowds approach typically produces much better statistical outcomes with better estimates of uncertainty too. Great work. I’m Lindy Hopping on my 4th continent now(5th if we count Oceanica) and have found the wealth demographic to be true. Quite ironic given the dance started in Harlem. Has anyone done such a census for Balboa? Balboa would be kind of tricky given that it is pretty much a subset of the Lindy Hop community (unlike, say, Blues which has its own, though overlapping, community). I was looking for statistics regarding France vs other countries. I saw on your site around 120000 lindy hoppers in the world, but how many in France and, if possible, in Nantes my hometown. Hi Gwen – the methodology that I used in the post is not really adaptable to individual countries and especially to individual scenes. It uses statistics and the law of large numbers to come up with the estimate. For working out the size of the scene in Nantes I would recommend that you ask people in your scene to guess the number and then average their answers – it should be reasonably accurate.